Another exciting tutorial for your reading and learning pleasure. 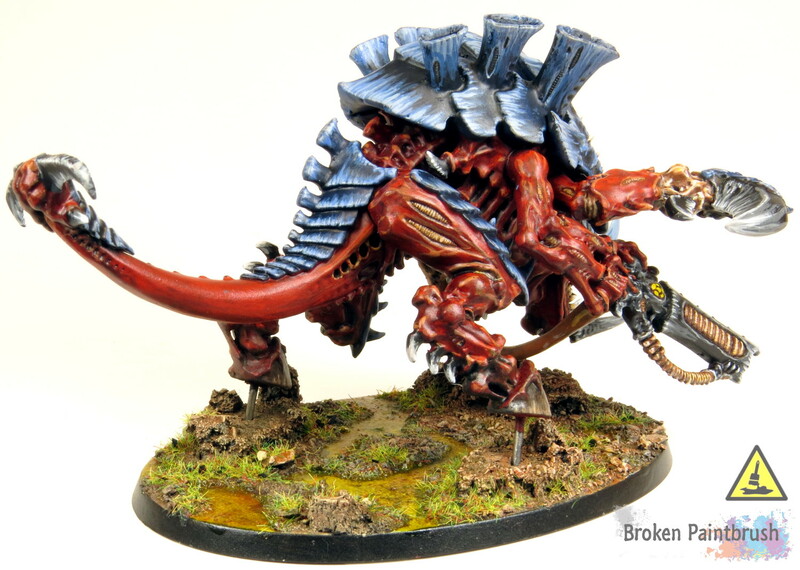 This time I go through the steps of painting a large base, in particular, the large oval base the Games Workshop provided in the Deathstorm box set for the Tyranid Carnifex. 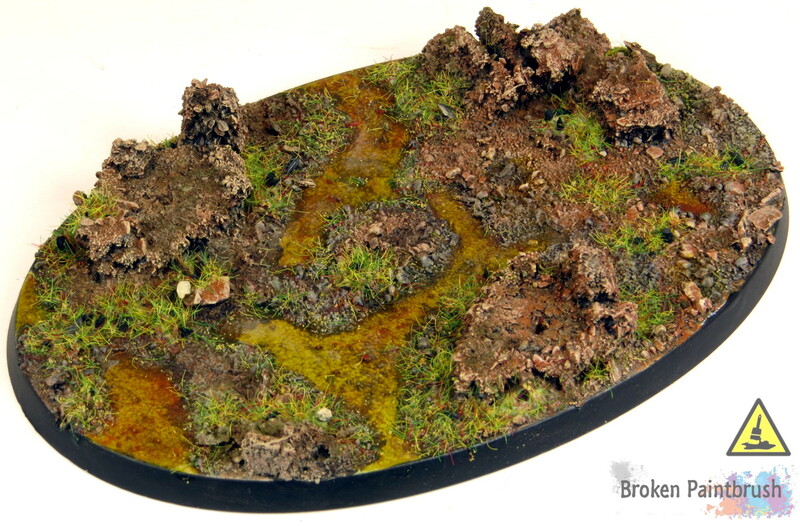 So, unfortunately, I didn’t grab a before paint shot, but I used an old cork coaster to create some rock clusters around the base, including two that I planned to have the Carnifex mounted on. I then applied the great Elmer’s Glue in large splotches to apply the rest of the rock texture. I intentionally left a few areas bare of grit to create water areas. The base was then primed with the rest of the models before given a nice heavy coat of Steel Legion Drab. A dry brush of Skrag Brown and then Ushabti Bone followed suit to provide the rock areas with a nice verity of colors and textures. The idea is to leave some of the base colors a bit thicker in some areas than others. 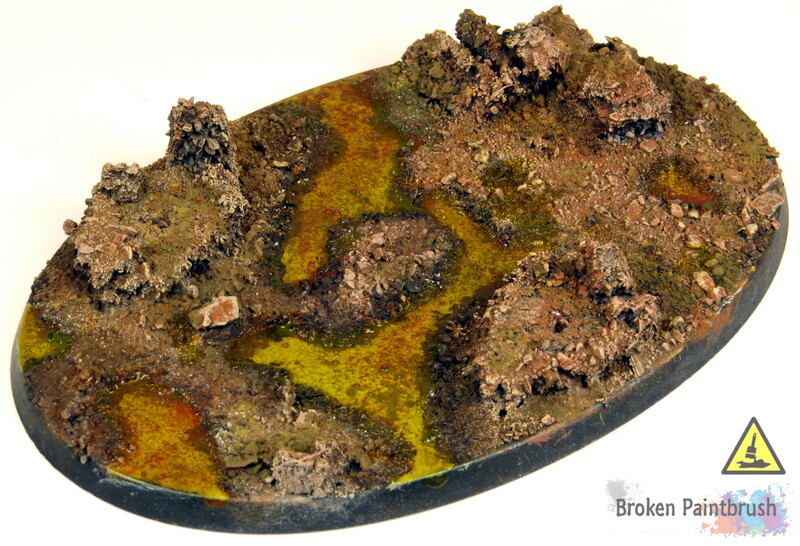 The water areas were based with a few thinned coats of Ogryn Camo. Here is where the fun begins! After learning about using my Flow Aid for powders, I immediately put it to practice. 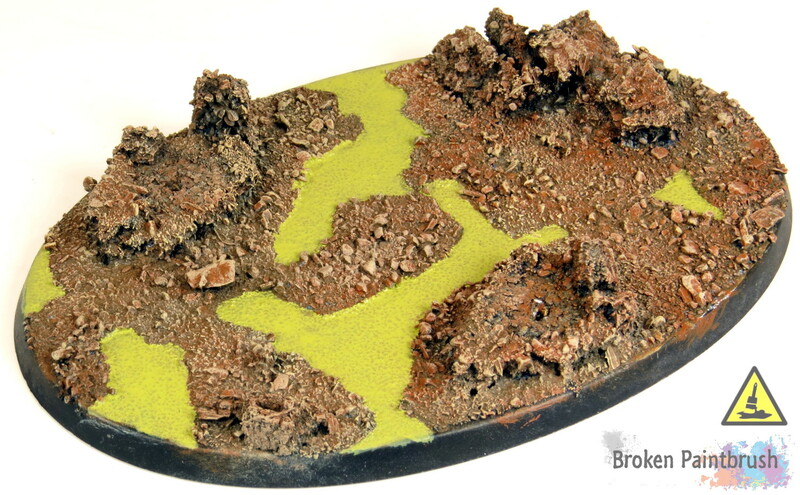 Along the edge between the rock/dirt and the water, I used Forge World’s Fresh Mud to create a wet earth look. The rest of the rock areas received splotches of Orange Rust, Grey Ash, Dark Sand, and even Faded Green powders. The flow aid was used to spread the powders in place while preventing them from becoming an overwhelming mess. 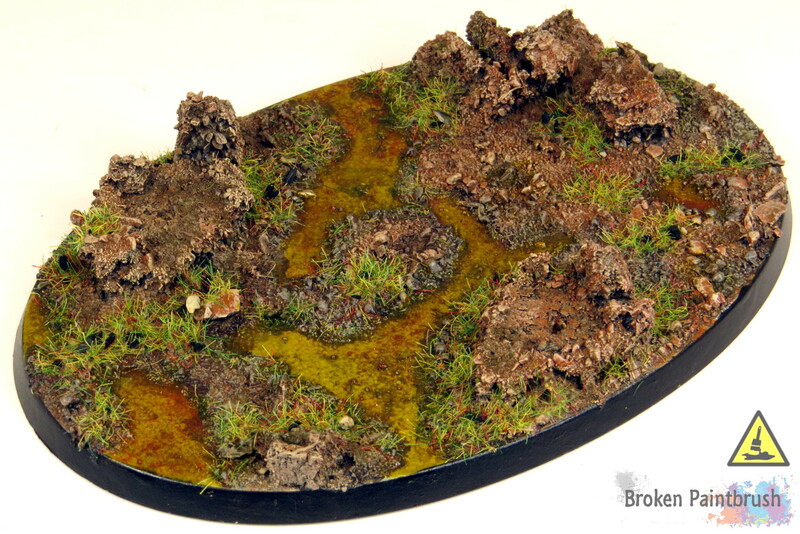 The watery areas then received a nice covering of Vallejo Dark Yellow Wash thinned down with Airbrush Medium. Some of the stray powders from the rocky areas were left in the water before the wash which added some nice variation to the water and tied in the colors. The wash was also ‘pushed’ into the darker edges to blend them in a bit as well. After the wash was dried the base was given a couple of coats of matte varnish to seal in the powders. Ushabti Bone was then broken back out for a final, light dry brush over the rocky textures which not only lightened the tops of the mud areas but cleaned up areas that received a bit too much powder. The rim was also given its first layer of ‘cleanup’ black which I like to save to last to help me see that it is nearly finished. Static grass was then added in small patches to add a bit of greenery. Once the glued dried another layer of black is applied to the rim to give it a nice, even coat, and another matte varnish is applied to seal it all together. Since the base is now a nice, matte finish the water no longer has that nice shimmer. To fix this situation a couple layers of ‘Ard Coat was added to both improve the depth of the water layer as well as add that gloss look to it. 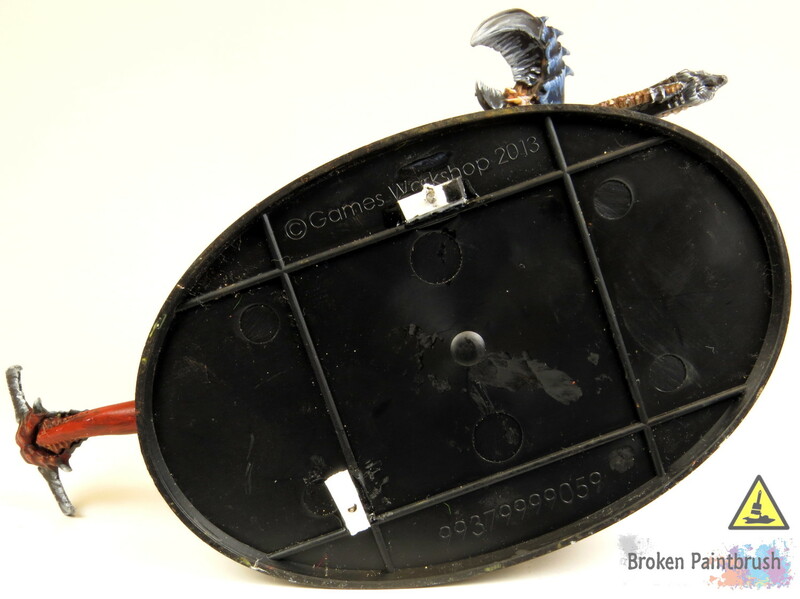 As you can see here, the feet of the Carnifex included nails that had corresponding holes in the base to pin it in place. This is important if gluing a model to a soft material like the cork as the glue has very little to hold onto and will easily break off. 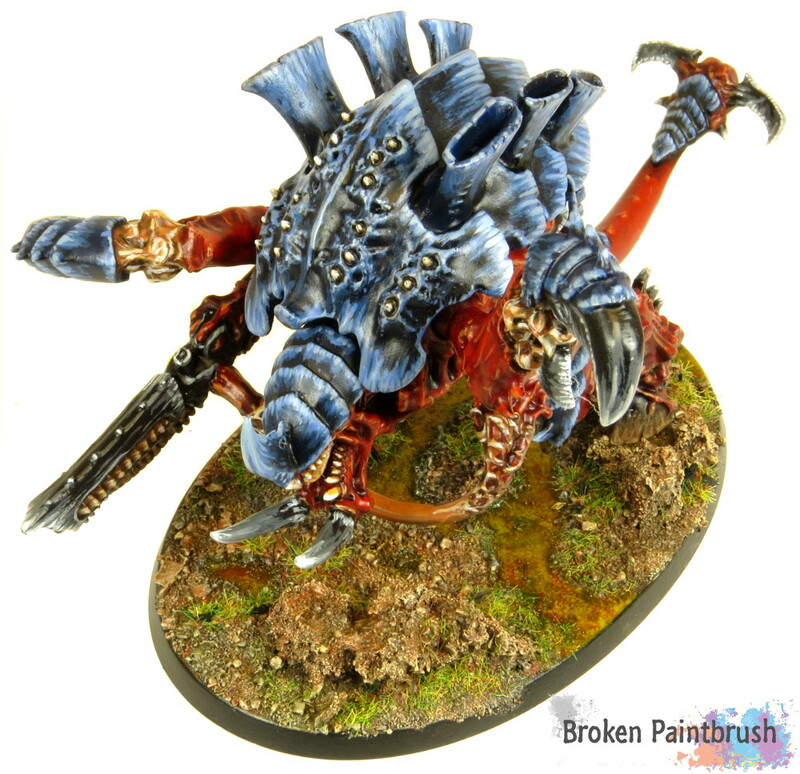 The nails also allowed the Carnifex to be stuck into wine corks to paint. To help support the nails through the thin base, I added a couple of pieces of plastic card to create a thicker area for the nails to grab onto. And now the finished piece. 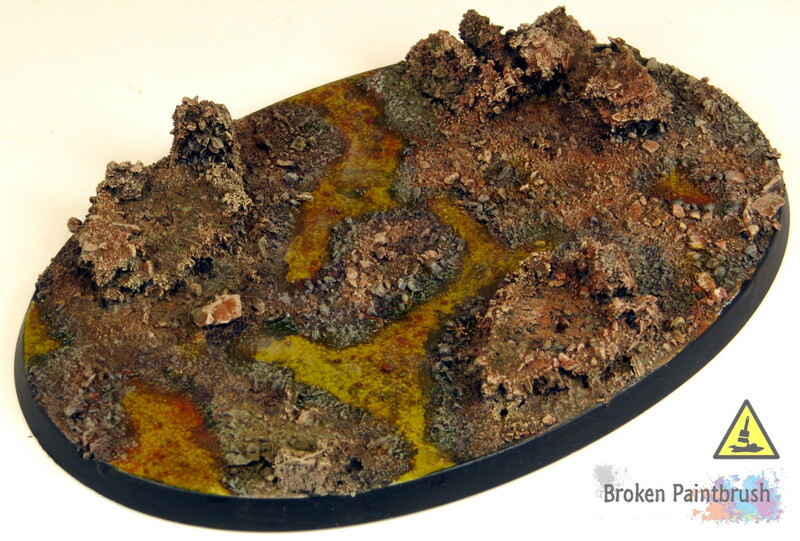 I hope this tutorial has helped inspire you in some way or provided a tidbit you can bring to your own bases. While they may not be as exciting as the model standing on top, the base can easily make or break a lovely model. 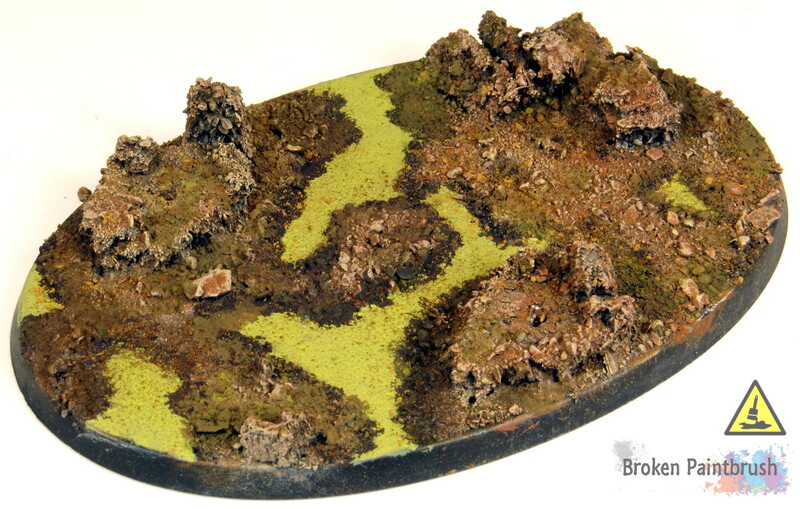 Let me know what you think of this tutorial or my basing technique in the comments below, I would love to hear from you.